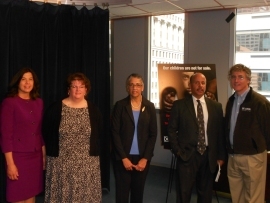 The FBI, Illinois Department of Children and Family Services, Cook County State’s Attorney’s Office and Cook County Sheriff’s Office have joined forces to launch a powerful media campaign aimed at raising public awareness about the human trafficking of youth in an event at on Tuesday in the Press Room located on the 15th Floor of the James R. Thompson Center, 100 W. Randolph St. in Chicago. Experts in social work and law enforcement say that while most people think of trafficking as an international issue, it’s happening in communities across Illinois. The awareness campaign, “Our Children Are Not for Sale,” asks the public to alert law enforcement and DCFS when they believe a child is a victim of human trafficking. An educational brochure defines trafficking, how to identify potential victims and perpetrators and what to do to seek help. In 2010, Illinois became one of the first states to pass comprehensive legislation to address the human trafficking of children under the age of 18. Under the Illinois Safe Children Act, children who are coerced into prostitution are immune from criminal prosecution and are diverted to the child protection system with DCFS instead of the criminal justice system. DCFS has established an allegation of Human Trafficking of a Child in child protection investigations. Law enforcement officers and mandated reporters of abuse and neglect are required to report to the DCFS Child Abuse Hotline whenever they have reason to suspect that a minor has been exploited by traffickers, and DCFS will investigate the allegation and may refer the family for protective, supportive and therapeutic services.